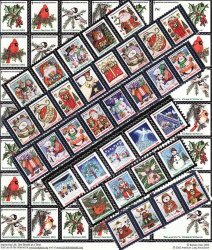 1982-2009 U.S. National Christmas Seal Collection, as required, strip, block, or sheet, full gum, F/VF, MNH. Issued by the American Lung Association (ALA). 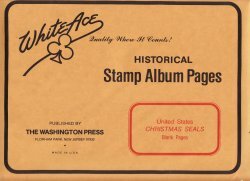 This set completes the White Ace Albums, Yuletide Albums, Saint Crispen Albums, and general collections from 1982 to 2009. 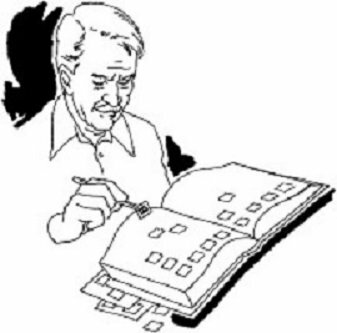 Set contains: Strips: 1983, 1985, 1989, 1990, 1992, 1993, 1994, 1997, 2001, 2004, 2005, 2006, 2007, 2008, 2009; Blocks: 1982, 1984, 1986, 1987, 1988; half-page: 1999, 2000, 2002; Full Sheets: 1991, 1995, 1996, 1998, 2003. This is the assortment described in the Green's Catalog, and required to complete the various albums, such as Yuletide Albums, or Saint Crispen Albums, or any general collection from 1982 to 2009.